And we then add in pairs the new numbers we just got. We do the same with those two numbers to get our final number. Then carry on descending until you have your SUPER SOLUTION!!! We really hope we helped! What have you done so far? It would be good to know what you have tried so we can try to help. We started at the top and worked down and you can only use 1 at the bottom. 2311 That is our method. Well done, Elliott and Toby! Well done, Elliott and Toby! Can you find any other solutions with 15 at the top? How many possible combinations are there? That's a really good number to find. You might like to look at other numbers at the top instead of 15. Say the numbers on the bottom row are a, b, c, and d respectively. The numbers on the second row will thus be a + b, b + c, and c + d. The numbers on the third row are a + 2b + c and b + 2c + d, and finally, the numbers on the top row are a + 3b + 3c + d. Thus, all one needs to do is to find nonzero solutions to the equation a + 3b + 3c + d = 15, of which there are infinitely many solutions. It would be good to see the first few of the"infinitely many" so we can get an idea as to why there re so many. Thanks. I've used "Reveal" here because this solution uses Mathematics that many under 14 year olds will probably not have come across and may find off-putting. I've used reveal here so that those who want to work on it on their own will not instantly see a solution without pressing "reveal". Great thanks for that, you've done some good work here. Stingrays class spent twenty minutes in competition with each other to create pyramids that added to fifteen. We double checked them all and we found 18 solutions!! A great puzzle we really enjoyed. Good to hear you liked it, it may inspire others. We came up with 22 solutions and we found them by starting from the top. We switched some numbers around to create more solutions and we worked out that if the numbers in the middle add to 2 the numbers on the outside must add to 9. Also, the numbers beneath the 15 cannot be 1, 2 or 3. The formula is a+3b+3c+d equals 15. You can swap the numbers in the middle and the numbers on the edge of the bottom row. It's for you to decide about the use of negative numbers. 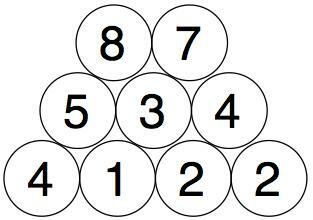 So it's a matter of finding 4 numbers, placing them in a row. Adding the first two together and putting the total above (probably above the space between your first two numbers). Doing the same with the 2nd and 3rd numbers and putting the total above (like in the first pair). Similarly for the last pair. Then you look at your new 3 numbers and add the first pair and put the total above, then similarly with the 2nd pair. You then look at your latest two answers and add them up and get a final answer and put that at the top. The exploration is about working out how to choose 4 starting numbers that will give you a final 15 at the top! We used only whole numbers. You cannot have an infinite number of solutions. The numbers 1, 2 and 3 cannot appear in the second row otherwise 1 will appear in the third row and you can't have 0 in the bottom row. 'There always has to be a 1 in the bottom row. If you have 4122 you can't count 2214 as it is just the same numbers but backwards. We found 11 solutions: 4122, 2131, 1118, 2221, 5211, 4115, 1132, 7112, 3116, 4212 and 3123. There will probably be some year 1's who will manage this, particularly if they have some physical numbers to move around. 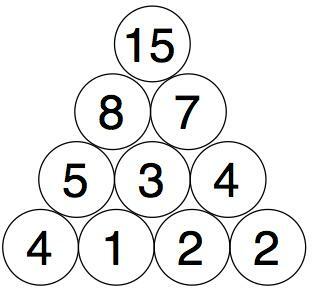 How many solutions did you find when you used different digits on the bottom row? We currently have 9 different sets of numbers on the bottom row! Can you put ten in? Yes Ricardo it's about being creative. We are the students of Room 11. A Year 4 classroom in Waterlea Primary School, in Auckland, New Zealand. Early on in the challenge, we found that starting from the top made it easier. We then tried many combinations of numbers and had 40 different solutions! Our teacher showed us that we had a few solutions that had doubled up, so we removed them. Then, we double-checked our answers and found that some were incorrect! Finally, we ended 22 different solutions. We are all very proud of the effort we put in! On the bottom row is A B C D.